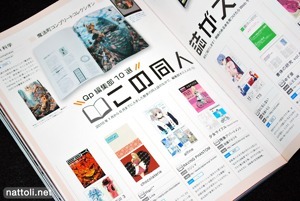 Much has changed since the first issue of Quarterly Pixiv Magazine. For one, the lovely poster is gone, replaced by nothing. 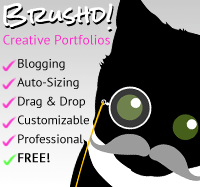 On the other hand, the magazine is now much more "how to" art focused, with just about every artist featured doing an illustration walkthrough or presenting tips and tricks for Photoshop or SAI. 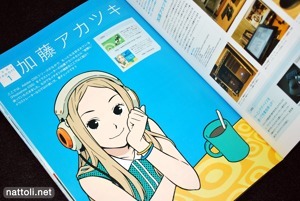 The artists' interviews are much shorter than in the first volume as well, leaving space for longer art tutorials. 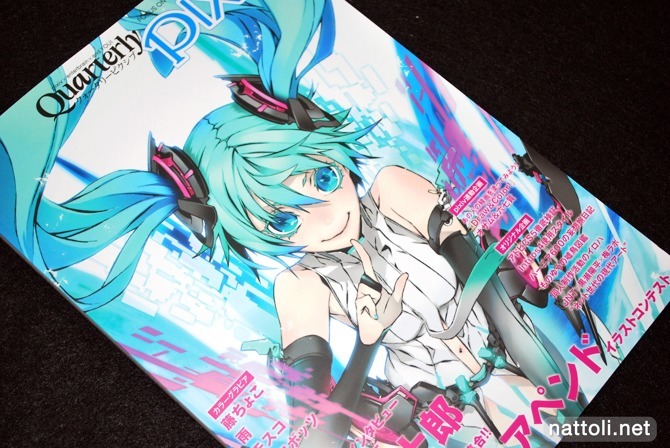 Immediately following the Miwa Shirow article are the Hatsune Miku Append contest illustrations, covering about 14-pages in total. And as with most Pixiv publications, the majority of the illustrations are featured in thumbnail sizes, but the Pixiv ID numbers are included on all the works so you can easily look them up. 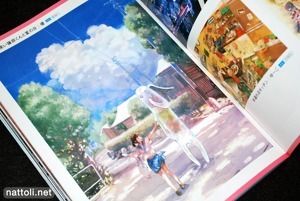 Three of the artists have two-page spread illustrations, made for this issue, that are accompanied by a walkthrough. 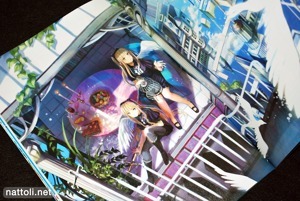 The first featured artist is Fuji Choco, who provided a very architecturally detailed world with two one-winged angels. You may have also recently seen her art work in July's Railway Girls and Scenery Pictorial Book. Ame is next, with her work recently featured in Railway Girls and Scenery Pictorial Book as well as Neko to Shoujo by RubiconHearts. 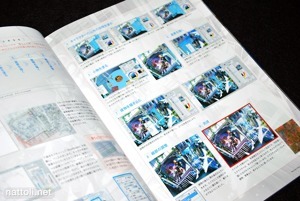 A couple more artists are featured in a similar manner, except the illustrations that get the walkthroughs are now single pages. Gorobots, and Izuru are the artists in this section. 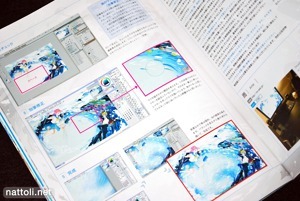 Akatsuki Katoh, whose C77 doujinshi SCRAP 2 I recently reviewed, gets a 6-page article on his work space and illustration technique, in a section titled "User Report." There are three "User Report" features in total, each with a different artist. 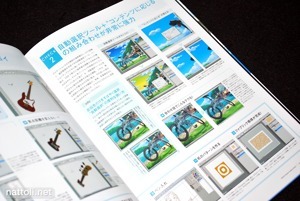 Another contest that was also running was the "Quarterly Pixiv Swimsuit Art Competition." The top finishers are featured, but only the first place winner gets a spread. Even second place received only half a page ^^; Some of the other sections in this issue are "Draw and Color" featuring line arts and finished works, along with funny bird illustrations by Monoyou. It does start to feel a bit more random at the end, but still artist-centric. 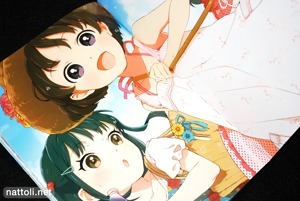 Towards the end, we get to see thumbnails of the Pixiv x Key collaboration project, as well as some smaller original illustrations. Also, in a similar fashion to Gelatin Magazine, there's a small section including the commercial and non-commercial books by the artists featured in this issue. Even though "how to" books have a few nice illustrations, the bulk of their content isn't something that interests me, and that's the feeling I'm getting with Quarterly Pixiv Vol. 02. Agreed regarding the how-to books, and it's the same feeling I get when I see tutorials on pubs like poppic. However, I think a lot of our readers are actually interested in that. 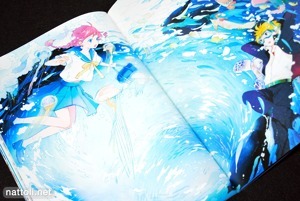 The illustrations look really nice though. It might warrant a get for me. If I had money. I always think putting posters is a pain since I will never use them for my walls and they bother my reading. Looks like it's worth the money only for Miwa Shirou, Gbot an Izuru! how to get some of that magazine..?